Stop it with Tesla (TSLA - Get Report) Mania! OK, just had to get that off the old chest. Shares of a company that sells electric cars and solar roofs were up 6.5% to $347.06 on Thursday afternoon, following better than expected earnings. Wait, that is losses as Tesla has no profits and may not have them for the foreseeable future. When all is said and done on the day, Tesla will widen its lead over Ford (F - Get Report) and General Motors (GM - Get Report) -- aka real car companies -- as the most valuable U.S. automaker. Are you kidding here people? Did you read this company's financial statements? Sure, investors are wagering today that CEO Elon Musk is the modern day Apple (AAPL - Get Report) founder Steve Jobs mixed with Henry Ford. I get it. But what I don't get is the pure infatuation with this company and its plans for the future. The company makes electric cars, one of which (Model 3) is hardly a mass market auto as being billed by Musk. Want mass market? Take a look at your local Kia dealership. Musk said he is going to raise money. The market shrugs. People, listen -- here comes more debt probably at a high rate layered on a company that is burning through cash because it's not profitable. Not good. 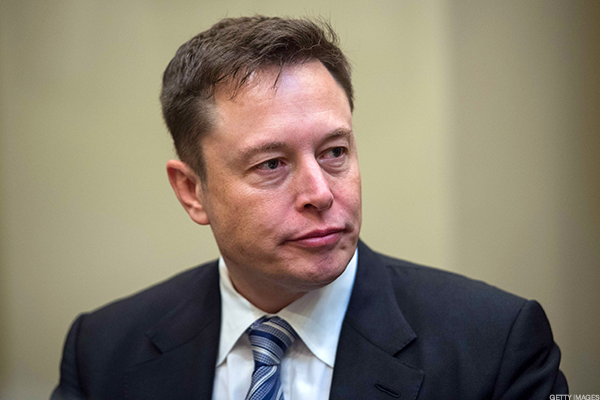 Musk still hasn't mastered the art of being a public company CEO. I would be more bullish on Tesla if Musk hired outgoing General Electric (GE - Get Report) CEO Jeff Immelt to be the public face of Tesla. Need a grownup that could talk to media and Wall Street. Competition is getting more fierce in the electric car space. By no means does Tesla have a monopoly. Mercedes, BMW and countless others are about to invade the market with some top-flight autos. Musk reportedly said on the call that 63,000 people have canceled their Model 3 orders in the past year, likely due to long wait times. This nugget was first reported by Business Insider. A company spokesman didn't immediately return a request for comment. If that isn't enough, remember the Tesla tax credit issue. Have a lovely day! Here is what TheStreet's U.K. Bureau Chief Martin Baccardax had to say on this one. Teva Pharmaceutical shares fell the most in nearly 20 years Thursday after the generic drug maker cut its full-year profit and slashed its dividend 75% owing to weaker U.S. markets and the ongoing political turmoil in Venezuela. Business underperforming meaningfully, guidance cut, cash flow guidance cut even more ...and most importantly, dividend cut significantly. Shares in the world's biggest generic drugmaker crashed 12.6% in Tel Aviv and changing hands at 9,750 Israeli shekels each by 13:25 London time, the biggest single-day decline since 1998. Teva said it now sees non-GAAP earnings per share of between $4.30 and $4.50 from a previous target of between $4.90 and $5.30, which it published in February and reaffirmed in May. Teva also cut is dividend 75% to 8.5 cents per share for its fiscal second quarter. "Second quarter results were lower than we anticipated due to the performance of our U.S. Generics business and the continued deterioration in Venezuela. These factors also led to a lowering of our outlook for the remainder of the year. All of us at Teva understand the frustration and disappointment of our shareholders in light of these results," said CEO Yitzhak Peterburg. "In our U.S. Generics business, we experienced accelerated price erosion and decreased volume mainly due to customer consolidation, greater competition as a result of an increase in generic drug approvals by the U.S. FDA, and some new product launches that were either delayed or subjected to more competition," Peterburg added.